Raptivity is all excited with its 10 years of presence in the eLearning industry and we believe that customers’ success is the backbone or the main reason behind Raptivity’s decade-long presence. A step further, we are happy to announce a mini-podcast with one of our customers citing their success story with Raptivity. 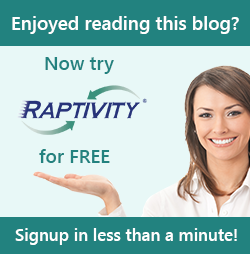 Chandra Clarke, President, Inklyo, provider of online writing courses and other practical resources for writers, has been using Raptivity over five years. Chandra’s experience with Raptivity has been phenomenal and a major driving force at Inklyo. We are happy to know that Chandra is utilizing Raptivity at Inklyo, and her experience over these years has been great too. Hear the podcast to know how Raptivity is benefitting Chandra and enabling thousands like her to explore interactivity, listen now.